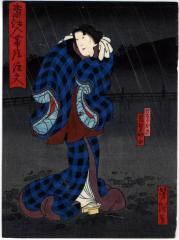 This print helps commemorate a performance of Edojiire Obiya no Chūmon (東仕入帯屋注文) at the Horie Theater in the first month of 1865. Illustrated in Ikeda Bunko, Kamigata Yakusha-e Shusei, (Collected Kamigata Actor Prints) volume 5, Ikeda Bunko Library, Osaka, 2005, no. 237.